Tenafly Nature Center is a non-profit, independent, member-supported nature preserve located in Bergen County, New Jersey-located just south of Rockland County and only 5 mins North of the GW Bridge. Since 1961, TNC has nurtured an appreciation for nature, been a leader in open-space preservation and in environmental education for our community and beyond. There is no charge for self-guided visits. You can also become a member, donate or volunteer. Seasonally based environmental programs are offered for families, adults and children of all ages. 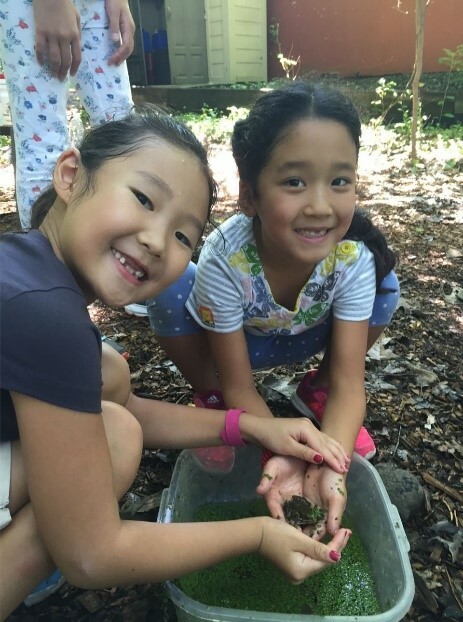 Children who like nature love camp at the Tenafly Nature Center! Our professional Environmental Educators lead outdoor activities that are fun and educational: hiking along TNC’s trails, engaging in nature-based crafts, games and activities. Campers will learn to identify native species and understand ecosystems and habitats throughout our nearly 400 acre forest. Sharp-eyed campers may spot native animals that live in TNC’s preserve; from Snapping Turtles to White-tailed Deer, Wild Turkeys, Bullfrogs, and Red-tailed Hawks. Sign up early, as spots are limited. Don’t let your child miss out on fun, hands-on nature experiences, outdoor discovery, and the chance to explore our native hardwood forest and pond ecosystems. Certified by the State to meet all NJ Youth Camp Safety health and safety standards. Camp ID #2248. Curriculum and activities are designed for children ages 4 to 14. Led by experienced, adult professional educators. Different sessions, grouped by age, meet each week. Preschool to 8th grade campers may attend multiple sessions, each with different themes and activities. A 1:9 teacher-to-child ratio enables us to give your child a lot of individual attention. Preschool and Kindergarten campers may attend half- or full-day sessions. 1st through 8th grade campers attend full day sessions. Option to extend care before or after regular day camp hours. Camp fee includes camp T-shirt and water bottle. We welcome kids of all abilities and will work closely with you to make sure your child has a great time! If a session is marked as Full, a wait list may be available. The 2017 camp season is June 26-September 1. Each session runs Monday through Friday (except for the week of July 4th). Full day sessions run from 9:00 am-3:30 pm. Survivor: Are you up for the challenge? Extended Care may be provided before and after camp for an additional fee. This is not an extended camp experience. During this time campers participate in supervised, self-directed, indoor activities. For more information on extended care, please visit our Registration & Policies page. Pre-K (4 & 5 years) & Kindergarten- Register Today! Animals may not wear capes, but they can be superheroes too! Some animals can perform amazing feats; other animals make our lives easier every day. Every night, your campers will be able to share with you crazy animal facts and the role animals play in making life more comfortable as we explore their incredible abilities. Is your child an adventure seeker? Out of the box thinker? If so, sign your child up for Explore Galore where we will begin examining the mysteries of life. How do small seeds become tall trees? Why do flowers smell? Why do animals camouflage? Explorers will head out into the forest to find answers to these perplexing questions! The ocean is a mysterious place filled with many sea creatures we don’t know much about! Dive in to a week full of ocean life. Campers will put on their swim goggles and learn about mammals, fish, and plants that spend their lives underwater. Did you know frogs once had tails and butterflies used to be caterpillars? We all change, but some of us change more than others. How do these animals change? Come investigate the life cycles of animals and plants of Tenafly Nature Center! You can never ask too many questions! Little Einsteins will look at the world with an open mind asking questions about how things work and why, making observations, and gathering information. All animals need food, water, shelter and space to live and grow. But what if those essentials were taken away? Campers will learn what living things need to survive and what will happen if humans take away all their resources. We will become Earth’s hero and learn how to save our planet from harm! What amazing critters have scales and tails? Campers will check out animals of the past and present with tales of the lives of these radical reptilians. Each day will focus on a different group of scaled species and the lives they live. 1st & 2nd Grade- Register Today! Animals may not wear capes, but they can be superheroes too! Some animals can perform amazing feats; other animals make our lives easier every day. Every night, your campers will be able to share with you crazy animal facts about how they protect themselves, eat, see, and hear differently and the role animals play in making life more comfortable as we explore the tremendous feats of animals. Blast off to a week far, far away! All week long young astronauts will learn about the planets, the moon, and the stars. We will explore how their patterns of motion can be predicted and observed. Campers will learn how we can survive on Earth and not other planets. We will explore the trails and maybe find aliens living among us! Let’s learn all about this strange change! Insects, amphibians, and even sea creatures undergo this amazing process. Campers will investigate the changes animals can go through as they develop. They’ll also discover other types of change in our forest through nature hikes and live animal encounters. Muahaha! Come experiment with us. Young scientists will conduct experiments and see what unfolds. Using their inquisitive skills they will test their theories and find out the difference between light and sound. Which objects can be seen if light is available and which give off their own light? Why do nocturnal eyes gleam in the dark? Let’s find out! Oh no! The Earth is in trouble! Using artifacts and live animals, campers will investigate the classifications of at-risk species and develop an appreciation for the diversity of organisms around us. Time will be spent learning about current issues scientists and citizens are working to solve, such as water shortages and climate change. 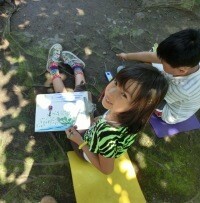 Campers will also determine ways to play their part to protect the planet! Does your child roam around, and around, and around? Let them roam along our trails this week at camp! As we wander the trails, campers will have a chance to see wildlife and learn outdoor survival skills such as building a shelter, and using a compass so you can be sure they always come home to you no matter whey they go. Campers will begin to use Science, Technology, Engineering, and Math to solve challenges. Opening up their minds to the factual world, campers will ask questions, make observations, and gather information to look problems from all angles. Was that a raccoon or a fox? Did you hear a bluejay or a red-tailed hawk? This week campers will become detectives and uncover the secrets of the forest. There will be mysteries needed to be solved and discover the truth of what animals do when we are not looking. Nature creates a beautiful landscape filled with vivid greens, brilliant blues, and the warm shades of autumn. Feathers and flowers may seem showy, but they carry important messages. Color can mean the difference between life and death! Campers will decipher the meaning of color, explore its role in nature, and search for examples on the trails. Can you walk through the woods without being detected? Did you make a sound? Stand out amongst the trees? Learn from the masters and discover how animals use their ninja skills to escape from predators and catch their prey. 3, 2, 1, BLAST OFF! Rocket into outer space and discover what is really out there. Campers will turn into astronauts this week and learn about our planets. Why can’t we live on Jupiter and is there really life on Mars? Did you know most of our planet is covered by water? It’s why our planet appears blue from space! The ocean is home to many creatures that we can not even see and many that we know nothing about! Come learn about which large sea creatures are lurking in the vast ocean. Transformers live among us. They are smaller than you think! Learn about which animals can change their bodies completely into something else and why. Through hikes and visits with live animals, campers will discover the many changes nature goes through. Science! Put on your lab coats, grab your safety goggles and get to work! Scientists will create theories and put them to the test. Research and conduct experiments to learn about the natural world and take these theories out onto the trails. Communicating with fellow scientists and sharing ideas are the key to finding solutions! “We abuse land because we regard it as a commodity belonging to us. When we see land as a community to which we belong, we may begin to use it with love and respect.” -- Aldo Leopold. Investigate the role humanity plays in the planet’s ecosystems and how we can be better citizens of our planetary community through our actions. Stories of stewards in science will inspire us to follow in their footsteps! What does it take to withstand the elements? Come to TNC and find out! Master the arts of shelter building, wayfinding, and lateral thinking while envisioning unconventional uses for everyday objects. Campers will develop a strong sense of confidence and strengthen rapport with others as they test the limits of their imagination and abilities. Scientists will study weather using Science, Technology, Engineering, and Math. Patterns in weather allow us to make predictions about what happens next. In addition, campers have a chance to discuss weather phenomenon from ball lightning to Super Storms like Hurricane Sandy. The most coveted superpower is the ability to fly. Birds can do it and so can bees. This week will focus on animals that have evolved to fly, as well as how humans learned to mimic their winged friends and take to the skies. Observation skills will be fostered as campers get into sky-related topics such as bird behavior, space, weather and the water cycle. Campers will gain a better understanding of the workings of the world above. Could you survive in the wilderness? Ever wonder how people survived without electronics? Learn to build fires, use a compass, build a shelter, and withstand the elements. Teens will develop an inner strength and confidence in their abilities in the natural world. Come to the STEM side. Teens will explore the advantages of Science, Technology, Engineering, and Math skills. They may discover their passion for Science while hitting the trails at camp. Scientists will work together testing their hypothesis and learn about natural selection, adaptation and genetic mutations. It’s all around us every time we turn on the TV: climate change, drought, wild fire, starving polar bears, water shortage. Why is this happening and how can we stop it? Students will collectively explore some of the most important issues perplexing scientists, governments and communities. We’ll figure out how we can cope with these issues and lessen their impact.